win a $200 giftcard to little vida! when i found out i was having another little boy, i knew i wouldn't need many new things since i had been through this whole "boy thing" twice before. but baby boy always needs a few things of his own, so when i wanted to get those perfect little pieces that were special and unique for my newest little addition little vida nyc was my first stop. of course, i found the sweetest little items just for him and naturally my love for this store and her great service kept me coming back. i just can't keep myself off this site scouring all of the beautiful things. 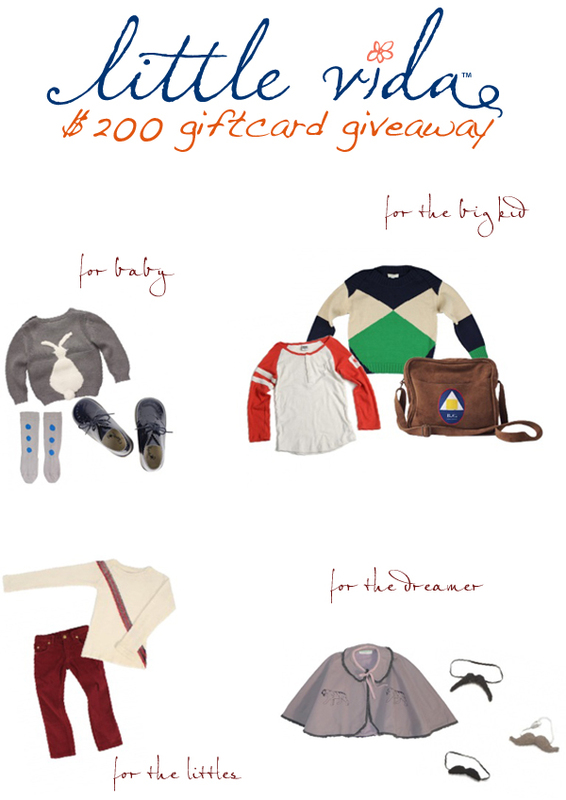 that is why i am SO excited to share that little vida nyc is giving away a $200 giftcard (shriek!) to a PIRATESandpeonies reader just in time for the holidays! this precious little shop is based out of NYC and is curated with some of the most amazing things - after reading about her fascinating city life below be sure to read carefully how you can enter. enjoy! here are some of my favorite items she is currently stocking. What is your favorite part of owning a boutique? The best part of owning a boutique is part being your own boss and part being the bearer of gifts. When someone orders from my store, I always imagine this person opening their boxes or their gifts, with all the excitement that comes from waiting for something in the mail. It makes me enjoy what I do much more. I also have to mention, being able to make decisions on what we bring to our customers and setting the standard of customer service we want, makes me happy. Where do you find style inspiration for yourself and Vida? My inspiration domes form everewhere and everything. When you love what you do , everything is inspiring. You see options and opportunities in everything. I get a lot ideas just by people watching. Living in NYC gives me plenty of that. What is the hardest thing about raising a child in the city? The are very few drawbacks to raising a child in the city. It's one of those cities where you can find and do everything. You get to interact with so many different cultures, it's amazing, but if I have to pick something hard about raising a child in NY it should be the lack of green spaces. They're so good for children. Where is your favorite place to go as a family in NYC? We really enjoy going to Central Park! We have a dog, so having a dog + a child + green areas + playground = Perfect Place for a family! We play, we run, we eat, we exercise, we enjoy every second that we spend in the park. My mornings start in my kitchen... with a BIG breakfast every day! What is the one thing you can't live without What is your number 1 holiday must have? What is your number 1 holiday must have? I would have to say Christmas tree. 3: head on over to little vida's online shop and tell us which item(s) you love and leave it in the comment form below. i will be verifying that the winner has done these 3 steps. **rafflecopter will be keeping track of all of the entries so please remember to mark off which steps you have done to be entered correctly! also follow all (or any) the other steps to gain additional entries - and do not change the wording in any way please. keep in mind our last winner won for her share on twitter! winner will be announced on december 22 and must claim prize within 10 days of being contacted or you will forfeit your winnings. LOVE LOVE LOVE the Scotch Shrunk graphic tee ! And all the cardigans!! Super cute stuff!! Love the Bobo Choses sweatshirt! I need the Go Gently baby bodysuit! I LOVE the Stella McCartney kids billy sweatshirt!! Go gently baby candy dress and the Stella mcCartney pumpkin sweater for my little guy! This is such an amazing giveaway! We would love to win. I love the Oeuf mustaches!! And the Scotch Shrunk "York" tee!! Fantastic shop!! Will become a new fav of mine! I love little vida, it will be so hard to choose what to get if I win. I love the pepe jubille or brogues, the Louis*Louise rosie dress, the bobo chooses sweatshirt for my little man, bobo chooses blouse for my daughter. Just a few of my top choices! I love the oeuf mustaches, Appaman baseball henley, Scotch shrunk graphic tee here.comes.trouble., Stella McCartney kids misty dress, louis * louise rosie dress, Dagmar Daley olivia skirt, the list could go on and on! Oh they have the cutest things! I love the Dagmar Daley striped henley, the Pepe sneakers, and the desert boots (all for boys). Thanks for the chance! My little lady needs the Lois Louise Rosie Dress, Scotch R'Belle Pull sweater and the Caramel baby&child Grandpa Cardigan! Oh I just hope we win. We could really use some good news over here in NJ. I love the boys Scotch shrunk check shirt and girls Dagmar Daley frances dress! Cute stuff from this place! Loving the scotch r'belle baggy flral pant, the scotch r'belle beach pant, the stella mccartney star belt, scotch r'belle romper with striped bodice, the woven play tiger cape, or Stella mccartney girls raincoat with the main line design (my fave!). In love with the Pale Cloud cape, the Nellystella lea jacket, the Go Gently Baby candy dress, the Pale Cloud woven dress, the Scotch R'belle dressed shorts, and the Laranjinha baby culotte romper!!! So many must-haves at this cute shop! Looking forward to keeping up with Little Vida! Thanks for sharing P&P! oopps i meant to say that i love the organic corner and that the weekend briefs are so cute! I love the detail and color of the woven play azure socks!! Such a fun shop! I love it all but the Hartford Star Dress is especially darling!! I have two daughters who both love looking like little princesses. The Stella McCartney kids tank dress is perfect because the straps would stay up well, and it would be great for layering. It's also fun and playful, which I love. LOVE the Appaman Madison Coat... But your right,, I really Love all of it!! The Scotch R'Belle Wool Vest is to dye for,,, and its in the GIRLS Section,, mostly all the fantastic finds I find are in the boys section!! I LOVE the Stella McCartney Sammy Sweater for my little guy. So cute. Sooo cute! I love the Louise Louise Martina Allover. I LOVE the Stella McCartney Sammy Sweater and the Caramel Baby & Child Jackson Dungarees...so cute! The items I really adore are the scotch shrunk crew neck sweater, scotch shrunk double layer tee, Stella McCartney kids Jude military jacket, pepe high top sneaker! The McCartney military jacket really grabbed me! I must have it for my son. There is no other jacket like it where I live. I really love the scotch shrunk chinos and graphic tee that says York , the Stella McCartney little pumpkin sweater , the little panda print pants , ohhhh I really just love it all ! !